The legal adviser to the European Union’s top court has backed the rights of football fans to see their World Cup and European Championship games free of charge on television. Advocate General Niilo Jaaskinen advised the court to dismiss the appeal of the FIFA and UEFA federations. The decision is a blow to UEFA and FIFA, who were keen to to sell their games to the highest bidders, thus circumventing the EU law that allows nations to pick certain sports events that must be shown on free-to-air television. Neither organisation can be said to be on its uppers, with the sale of football rights remaining remarkably recession proof in this age of austerity. UEFA got at least €800 million in broadcast rights from EURO 2012 hosted in Ukraine and Poland. FIFA took €1.85 billion in broadcast rights for the 2010 World Cup in South Africa. FIFA’s motives for challenging the status quo are financial and therefore transparent; but what of UEFA, whose president, Michel Platini, claimed last week that he was changing the format of Euro 2020 for the benefit of the fans? The more we hear from him, the more it pays to be sceptical of his intentions. Arsenal manager Arsene Wenger says his side should not be embarrassed by their Capital One Cup quarter-final defeat at League Two Bradford. The Gunners lost 3-2 on penalties after managing a late 1-1 draw in normal time at Coral Windows Stadium. It was the most humiliating result for the club since Wenger took charge in 1996, notwithstanding last season’s 8-2 defeat to Manchester United. “We did absolutely everything for 120 minutes and you have to give credit to Bradford,” said Wenger. “You feel embarrassed when you don’t give everything, I think they’ll be more disappointed and frustrated. “It was a great cup tie on a tough pitch and I cannot fault the effort from my players. It was a typical English cup tie and Bradford got on top of us. They started stronger than us and congratulations to them. Wenger’s grace in defeat is admirable, not least as this setback occurs at a time when speculation about his own future is reaching fever pitch. The worry for Wenger is not the diminution of goodwill that has sustained him throughout seven barren, trophyless years, but that he is now perceived to be a figure of ridicule by a growing number of the club’s supporters. For someone who seems himself as a cerebral manager, that will hurt. A humbling night for Arsenal then, but even their most crestfallen supporter would surely not begrudge their opponents, for whom the victory was a potential lifesaver. “It has secured our long-term future,” Bradford City director of operations Dave Baldwin told BBC Radio Leeds. Baldwin said the club, who are fourth in League Two, was projected to overspend on wages by £600,000 as they push for promotion to League One. He estimated Tuesday’s match, which was watched by the club’s biggest gate since 1960, would earn £300,000. A good week for Bradford culminated with them discovering their appeal against expulsion from the FA Cup has been successful and they have been reinstated to the competition. Godfrey Chitalu is a name not many people outside Zambia will have been familiar with until today. However, we may be hearing more about him in the next few days after officials from the Zambian Football Association insisted that he, and not Lionel Messi, is the true holder of the highest number of goals in a calendar year. Messi’s two goals at Real Betis on Sunday took him past Gerd Müller’s officially recognised 40-year-old record of 85. However, the Zambian FA told Soccer Laduma that they would present evidence to FIFA to show that the Kabwe Warriors striker Chitalu scored 107 goals in 1972. If verified that would mean Messi is currently 21 goals behind Chitalu and even allowing for his near-superhuman powers, it is a big ask for him to reach that target in the remaining three games of 2012. “We have this record, which has been recorded in Zambian football, but unfortunately it has not been recorded in world football,” said a Zambia FA spokesperson. “Even as the world has been looking at Lionel Messi’s record, breaking Gerd Müller’s, the debate and discussion back here has been why Godfrey’s goals are not being recognised. “What we are doing is, we have commissioned an independent team locally to go back into the archives and record minute-by-minute each of those goals. The team that we have put together is going to calculate all of those goals, recording whichever game or tournament they were scored in. Chitalu, who was Zambian football of the year on five occasions, went on to become coach of the national team. Sadly, he died in 1993 when a plane carrying the team crashed near Gabon. Chelsea are struggling to get over jet lag ahead of Thursday’s Club World Cup semi-final against Monterrey of Mexico. Chelsea manager Rafael Benitez said the team was still adjusting to the time change after arriving on Sunday on the journey from London. “My players are focusing on trying to sleep,” Benitez said. When it comes to jet lag and associated sleeping disorders, different players will undoubtedly require different strategies. For some, it will simply be a case of getting them on to the new sleep schedule as soon as they arrive in the country; for others, sleeping tablets may be advisable; and if you want Fernando Torres to get to sleep, just tell him the game is about to kick off. For Benitez, a manager who likes to take full credit when his team wins, but can provide a litany of excuses when they lose, the Japanese experience is proving to be fertile territory. “We are trying to adapt to the time, pitch and ball. Everything is new,” he added, sounding less like the urbane, well-travelled coach we know him to be, and more like a British tourist in the throes of a culture shock on discovering that the rest of Europe serves beer in litres and not pints. Meanwhile, Chelsea defender Gary Cahill believes his teammates have come to appreciate the status of the event – somewhere between Johnstone’s Paint Trophy and Capital One Cup in the UK, although with lower brand recognition. Cahill, who joined Chelsea from Bolton Wanderers in January, is relishing his time with some of the biggest names in the game. Enjoy it while it lasts, it could be a long while before Chelsea appear on this stage again. The German football league (DFL) and clubs from the top two divisions have agreed on a new set of security measures after a sharp rise in violence and pressure from politicians to act. The DFL and the 36 clubs from the top two leagues voted in favour of tougher stadium checks, increased crackdown on flares and smoke bombs and tougher sanctions, video monitoring, and better-trained security staff. Some 500 fans, who were unhappy with the new restrictions and who felt excluded from a process that directly affects them, demonstrated outside the Frankfurt hotel where the meeting took place. The report said the 2011-12 season had the highest number of criminal proceedings in 12 years, almost double the number of injured fans and a more than 20 percent rise in police work hours from the previous season. Gervinho’s woeful attempt for Arsenal against Bradford City was a rare case of it being easier to score than miss. Rennes coach Frederic Antonetti adopts the moral high ground after his side’s 1-0 defeat to Nice. Fulham have withdrawn their complaint over Liverpool’s pursuit of Clint Dempsey after the Merseyside club sent them a letter of apology. Fulham reported Liverpool to the Premier League this summer after the west London club became annoyed at what they considered to be their attempt to illegally ‘tap up’ Dempsey. Rodgers was then forced to backtrack, insisting the club had made their approach privately to the Premier League club. “For me there is nothing to say on it,” he said at the time. In the absence of any contrition from Rodgers, it was left to Liverpool chairman Tom Werner to issue a written apology to Fulham. A statement on Fulham’s website read: “Fulham can confirm that it has withdrawn the complaint made against Liverpool FC in regard to the Merseyside club’s inappropriate actions surrounding interest in Clint Dempsey over the summer. “Liverpool’s chairman Tom Werner apologised personally to Mohamed Al Fayed, stating that his club were wholly responsible for unprofessional behaviour toward Fulham and emphasised his regret for the entire episode. “In a letter from Liverpool to Fulham’s CEO Alistair Mackintosh, Tom Werner’s praise of the magnanimous gesture from the chairman was reiterated, as was the club’s assurance that the conduct of Liverpool was simply not acceptable. 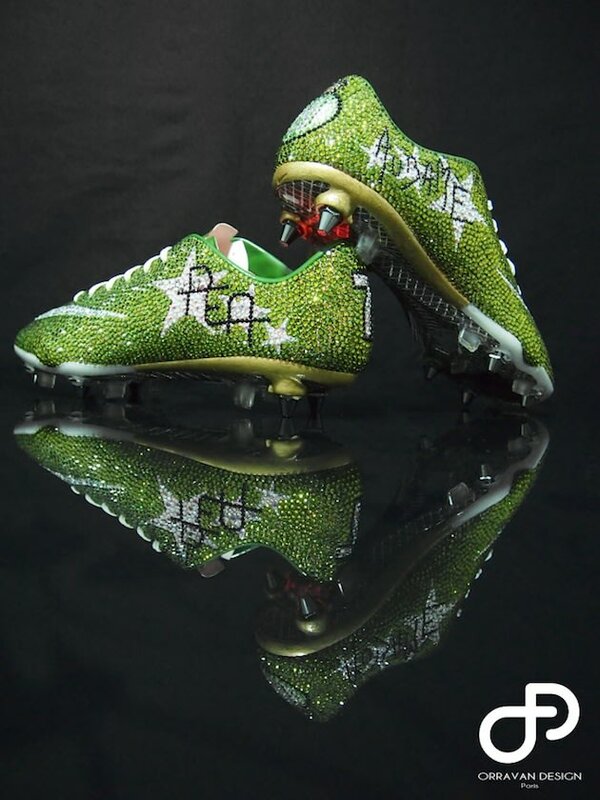 There was some stunning Swarovski crystal worn by Saint-Etienne forward Pierre-Emerick Aubameyang on Monday night. Unfortunately, they were on his feet and he was standing on the football pitch at the time. The boots are a one-off design by Orravan Design using more than 4,000 crystals and took 50 hours to complete. Reportedly, they are valued at €3000. Mercifully, for those of a sensitive disposition, the Gabon international, who sported the bling boots for the warm up, switched to a regulation pair for the match itself.